235535 G.S6D110-1 KOMATSU Diesel Engine G.S6D110-1 Spare parts catalog. Service(Shop) Manual. 235536 G.SA6D110-1 KOMATSU Diesel Engine G.SA6D110-1 Spare parts catalog. 235537 G.SA6D110-1A KOMATSU Diesel Engine G.SA6D110-1A Spare parts catalog. 235538 G.SA6D110-1D KOMATSU Diesel Engine G.SA6D110-1D Spare parts catalog. 235539 G.SA6D110-1W KOMATSU Diesel Engine G.SA6D110-1W Spare parts catalog. 235540 S6D110-1A KOMATSU Diesel Engine S6D110-1A Spare parts catalog. 235541 S6D110-1B KOMATSU Diesel Engine S6D110-1B Spare parts catalog. 235542 S6D110-1G KOMATSU Diesel Engine S6D110-1G Spare parts catalog. 235543 S6D110-1K KOMATSU Diesel Engine S6D110-1K Spare parts catalog. 235544 S6D110-1Q KOMATSU Diesel EngineS6D110-1Q Spare parts catalog. 235545 S6D110-1R KOMATSU Diesel Engine S6D110-1R Spare parts catalog. 235546 S6D110-1V KOMATSU Diesel Engine S6D110-1V Spare parts catalog. 235547 SA6D110-1 KOMATSU Diesel Engine SA6D110-1 Service(Shop) Manual. 235548 SA6D110-1A KOMATSU Diesel Engine SA6D110-1A Spare parts catalog. 235549 SA6D110-1C KOMATSU Diesel Engine SA6D110-1C Spare parts catalog. 235550 SA6D110-1D KOMATSU Diesel Engine SA6D110-1D Spare parts catalog. 235551 SA6D110-1EE KOMATSU Diesel Engine SA6D110-1EE Spare parts catalog. 235552 SA6D110-1F KOMATSU Diesel Engine SA6D110-1F Spare parts catalog. 235553 SA6D110-1G KOMATSU Diesel Engine SA6D110-1G Spare parts catalog. 235554 SA6D110-1J KOMATSU Diesel Engine SA6D110-1J Spare parts catalog. 235555 SA6D110-1N KOMATSU Diesel EngineSA6D110-1N Spare parts catalog. 235556 SA6D110-1P KOMATSU Diesel Engine SA6D110-1P Spare parts catalog. 235557 SA6D110-1P-B KOMATSU Diesel Engine SA6D110-1P-B Spare parts catalog. 235558 SA6D110-1Q KOMATSU Diesel Engine SA6D110-1Q Spare parts catalog. 235559 SA6D110-1R KOMATSU Diesel Engine SA6D110-1R Spare parts catalog. 235560 SA6D110-1S KOMATSU Diesel Engine SA6D110-1S Spare parts catalog. 235561 SA6D110-1T KOMATSU Diesel Engine SA6D110-1T Spare parts catalog. 235562 SA6D110-1U KOMATSU Diesel Engine SA6D110-1U Spare parts catalog. 235563 SA6D110-1V KOMATSU Diesel Engine SA6D110-1V Spare parts catalog. 235564 SA6D110-1W KOMATSU Diesel Engine SA6D110-1W Spare parts catalog. 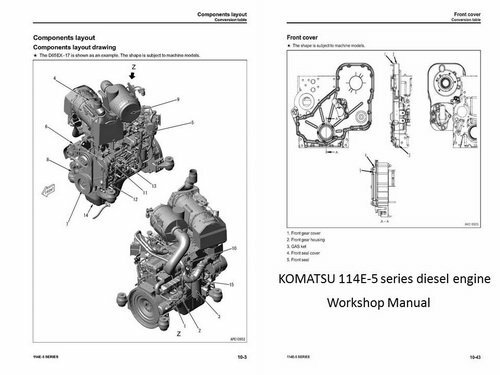 235575 S6D114E-1 KOMATSU Diesel Engine S6D114E-1 Service(Shop) Manual. 235576 S6D114E-1A KOMATSU Diesel Engine S6D114E-1A Spare parts catalog. 235577 S6D114E-1A-W KOMATSU Diesel Engine S6D114E-1A-W Spare parts catalog. 235578 S6D114E-1-GD KOMATSU Diesel Engine S6D114E-1-GD Spare parts catalog. 235579 S6D114E-1-KB KOMATSU Diesel Engine S6D114E-1-KB Spare parts catalog. 235580 SA6D114 KOMATSU Diesel Engine SA6D114 Service(Shop) Manual. 235581 SA6D114-1AA KOMATSU Diesel Engine SA6D114-1AA Spare parts catalog. 235582 SA6D114E-1 KOMATSU Diesel Engine SA6D114E-1 Service(Shop) Manual. 235583 SA6D114E-1A-KU KOMATSU Diesel Engine SA6D114E-1A-KU Spare parts catalog. 235584 SA6D114E-1-GD KOMATSU Diesel Engine SA6D114E-1-GD Spare parts catalog. 235585 SA6D114E-2 KOMATSU Diesel Engine SA6D114E-2 Spare parts catalog. Service(Shop) Manual. 235586 SA6D114E-2-KB KOMATSU Diesel Engine SA6D114E-2-KB Spare parts catalog. 235587 SA6D114E-2-TR KOMATSU Diesel Engine SA6D114E-2-TR Spare parts catalog. 235588 SAA6D114E-1 KOMATSU Diesel Engine SAA6D114E-1 . Service(Shop) Manual. 235589 SAA6D114E-2 KOMATSU Diesel Engine SAA6D114E-2 Spare parts catalog. Service(Shop) Manual. 235590 SAA6D114E-2A KOMATSU Diesel Engine SAA6D114E-2A Spare parts catalog. 235591 SAA6D114E-2AA KOMATSU Diesel Engine SAA6D114E-2AA Spare parts catalog. 235592 SAA6D114E-2A-A KOMATSU Diesel EngineSAA6D114E-2A-A Spare parts catalog. 235593 SAA6D114E-2AA-VH KOMATSU Diesel Engine SAA6D114E-2AA-VH Spare parts catalog. 235594 SAA6D114E-2A-KU KOMATSU Diesel Engine SAA6D114E-2A-KU Spare parts catalog. 235595 SAA6D114E-2B KOMATSU Diesel Engine SAA6D114E-2B Spare parts catalog. 235596 SAA6D114E-2BA KOMATSU Diesel Engine SAA6D114E-2BA Spare parts catalog. 235597 SAA6D114E-2B-A KOMATSU Diesel Engine SAA6D114E-2B-A Spare parts catalog. 235598 SAA6D114E-2BB-VH KOMATSU Diesel Engine SAA6D114E-2BB-VH Spare parts catalog. 235599 SAA6D114E-2CC-8M KOMATSU Diesel Engine SAA6D114E-2CC-8M Spare parts catalog. 235600 SAA6D114E-2CC-8W KOMATSU Diesel Engine SAA6D114E-2CC-8W Spare parts catalog. 235601 SAA6D114E-3 KOMATSU Diesel Engine SAA6D114E-3 Spare parts catalog. Service(Shop) Manual. 235602 SAA6D114E-3A KOMATSU Diesel Engine SAA6D114E-3A Spare parts catalog. 235603 SAA6D114E-3AA-M KOMATSU Diesel Engine SAA6D114E-3AA-M Spare parts catalog. 235604 SAA6D114E-3AA-W KOMATSU Diesel Engine SAA6D114E-3AA-W Spare parts catalog. 235605 SAA6D114E-3A-MT KOMATSU Diesel Engine SAA6D114E-3A-MT Spare parts catalog. 235606 SAA6D114E-3A-WT KOMATSU Diesel Engine SAA6D114E-3A-WT Spare parts catalog. 235607 SAA6D114E-3B KOMATSU Diesel Engine SAA6D114E-3B Spare parts catalog. 235608 SAA6D114E-3B-A KOMATSU Diesel Engine SAA6D114E-3B-A Spare parts catalog. 235609 SAA6D114E-3BB-W KOMATSU Diesel Engine SAA6D114E-3BB-W Spare parts catalog. 235610 SAA6D114E-3B-MT KOMATSU Diesel Engine SAA6D114E-3B-MT Spare parts catalog. 235611 SAA6D114E-3B-WT KOMATSU Diesel Engine SAA6D114E-3B-WT Spare parts catalog. 235612 SAA6D114E-3C KOMATSU Diesel EngineSAA6D114E-3C Spare parts catalog. 235613 SAA6D114E-3C-MT KOMATSU Diesel Engine SAA6D114E-3C-MT Spare parts catalog. 235614 SAA6D114E-3C-WT KOMATSU Diesel Engine SAA6D114E-3C-WT Spare parts catalog. 235615 SAA6D114E-3D KOMATSU Diesel Engine SAA6D114E-3D Spare parts catalog. 235616 SAA6D114E-3D-MT KOMATSU Diesel Engine SAA6D114E-3D-MT Spare parts catalog. 235617 SAA6D114E-3D-WT KOMATSU Diesel Engine SAA6D114E-3D-WT Spare parts catalog. 235618 SAA6D114E-3E KOMATSU Diesel Engine SAA6D114E-3E Spare parts catalog. 235619 SAA6D114E-3LL KOMATSU Diesel Engine SAA6D114E-3LL Spare parts catalog. 235620 SAA6D114E-5 KOMATSU Diesel Engine SAA6D114E-5 Service(Shop) Manual. 235621 SAA6D114E-5A KOMATSU Diesel Engine SAA6D114E-5A Spare parts catalog. 235622 SAA6D114E-5B KOMATSU Diesel EngineSAA6D114E-5B Spare parts catalog. 235632 4D115-1G KOMATSU Diesel Engine 4D115-1G Spare parts catalog. 235633 6D115-1 KOMATSU Diesel Engine 6D115-1 Spare parts catalog. 235643 SA6D117-1W KOMATSU Diesel Engine SA6D117-1W Spare parts catalog. 235655 4D120-10A KOMATSU Diesel Engine 4D120-10A Spare parts catalog. 235656 4D120-10S KOMATSU Diesel Engine4D120-10S Spare parts catalog. 235657 4D120-11A KOMATSU Diesel Engine 4D120-11A Spare parts catalog. 235658 4D120-11B KOMATSU Diesel Engine 4D120-11B Spare parts catalog. 235659 4D120-11C KOMATSU Diesel Engine 4D120-11C Spare parts catalog. 235660 4D120-11D KOMATSU Diesel Engine 4D120-11D Spare parts catalog. 235661 4D120-11E KOMATSU Diesel Engine 4D120-11E Spare parts catalog. 235662 4D120-11G KOMATSU Diesel Engine 4D120-11G Spare parts catalog. 235663 4D120-11S KOMATSU Diesel Engine 4D120-11S Spare parts catalog. 235664 6D120-10 KOMATSU Diesel Engine 6D120-10 Spare parts catalog. 235665 S4D120-11A KOMATSU Diesel Engine S4D120-11A Spare parts catalog. 235666 S4D120-11B KOMATSU Diesel Engine S4D120-11B Spare parts catalog. 235667 S4D120-11C KOMATSU Diesel Engine S4D120-11C Spare parts catalog. 235668 S4D120-11D KOMATSU Diesel Engine S4D120-11D Spare parts catalog. 235669 S4D120-11F KOMATSU Diesel Engine S4D120-11F Spare parts catalog. 235670 S4D120-11G KOMATSU Diesel Engine S4D120-11G Spare parts catalog. 235671 S4D120-11S KOMATSU Diesel Engine S4D120-11S Spare parts catalog. 235677 6M122A(P)-1 KOMATSU Diesel Engine 6M122A(P)-1 Service(Shop) Manual.